I get quite a few questions about this subject, so I thought Id clear up what I mean when I talk about it. Maybe we should call it "Accurately Resetting Cam Timing"
Up until the 2V models of 2001, all the belt drive engines have come with cam pullies that are not adjustable. Just a pulley with a keyway for the locating key between it and the camshaft. On the 2001 2V models, a new, 3 piece pulley was introduced. This is, in real terms, a Ducati version of the aftermarket pulley we have been buying from Vee Two for years. They look a bit different, being steel instead of aluminium, and have 3 pinch bolts, instead of 5. Minor details differences, but doing the same job. The new Testastretta 4V engines also have this style of pulley, although they are larger on these engines than the 2V. For this reason, resetting the cam timing on the late 2V and Testastretta engines is cheaper, as you dont need to replace the pullies. Just check and reset, as we like. For the engines with non-adjustable pullies, we replace them with Vee Two adjustable pullies. Available in a variety of anodised colours, these offer infinite adjustment. This infinite adjustment comes from the fact that each pulley has 45 or so degrees of variation available. With each tooth on the std size ( 18 tooth ) pulley corresponding to 40 degrees of rotation, if the 45 degrees isnt enough, you simply move the pulley one tooth on the belt, remark the reference dot and continue on. Easy. It is also possible to use offset keys to reset the cam timing. These offset keys fit like a normal woodruff key between the camshaft and the pulley. Because the portion that sits in the cam is offset in relation to the portion that sits in the pulley, the pulley is rotated around the cam. This is then used to either advance or retard the cam, as desired. I try to stay away from the offset keys, for a few reasons. Mainly based on how many you need to have on hand to ensure you can do any job, and the accuracy and limited range they offer. So, to the next point of contention. Some people get on the "why would you do it different to what the factory says?" route. Well, Id like to ask someone at the factory why they never bothered playing with the cam specs. Some say it has to do with emissions, but I cant see that personally. Just one of those unknown things. Given the 4V Strada cams have been the same since 1988, when the 851 was first introduced, its obvious they werent looking too hard. The new inlet cams in the S4 and ST4S are slightly different, closing the inlet 10 degrees earlier. Not a great deal of development for 13 years. But then, thats Ducati. Once they start building something, you can pretty much bet they wont be changing engine spec for the life of the model. Anyway, all my opinions are based on experience. Given the improvements Ive gained from pretty much all the models Ive done, I feel Im on the right track. And, if it doesnt work ( ala 600M ), I say so. There is also confusion over how certain models come from the factory. Ive had a few people tell me over the years that their SP or SPS came from the factory with "dialed cams". Which is incorrect. None of the models have ever been checked at the factory on assembly. Sometimes they have been fitted with offset keys, as some of the SPSs had on the timing shaft pullies, but it was never an accurate thing. The late 2V engines with the std adjustable pullies and the Testastretta engines have a new method for setting cam timing, consisting of an engine holding tool and cam holding tools. These tools lock the engine and cams in position while the cam belts are tensioned, then the lock screws on the adjustable pullies are tightened. 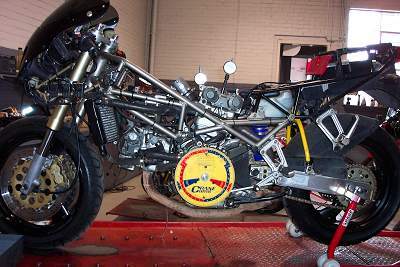 Usually, this gives a result within the Ducati allowance of +/- 3 degrees variation from std spec. How far off the "as assembled" cam timing is also varies. Lots of 4V engines are around 8 to 10 degrees retarded on the vertical cylinder cams and 3 to 5 degrees retarded on the horizontal cams. Resetting them to the std spec will certainly make an improvement, but more can be had fairly easily. I dont bother checking engines before I fit the Vee Two pullies anymore. I just replace the pullies and get on with the job. This is because I know the cams wont be anywhere near where Im going to reset ( or "dial" ) them to. The new, non-factory settings I use for the cam timing do require mods to the fuel mapping on injected bikes, which is why I dyno and tune most bikes after the job is done. We dont do the 996SPS, 996S or the 900SS, as we have custom chips ( SPS/S ) and Flashload map ( SS ) to suit these models. Most of the other models I can set up from experience anyway, but its usually better to check. Many owners like to see a dyno graph anyway, often requesting before and after runs ( at extra cost, of course ). The carb bikes can get along just fine with std jetting, although a jet kit will deliver more performance. So there you have it. 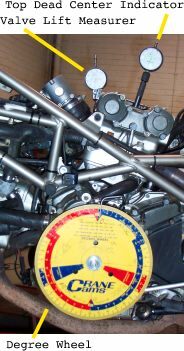 The term "dialing cams" simply refers to accurately resetting the cam timing from the "as assembled" timing to new timing specs based on our experience of what works. As a general rule, the peak power achieved by the engine wont change ( maybe increase a little ). Below the peak, however, more power ( and, correspondingly, torque ) will be produced at any given RPM. Improvements in response and smoothness are also noted by most owners.